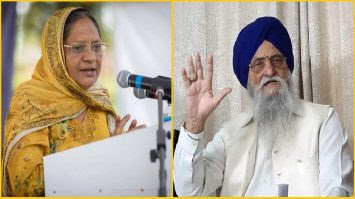 Posted: 14 Apr 2019 07:45 AM PDT CHANDIGARH, Punjab—Taking observation of Sikh sentiments, the Shiromani Akali Dal (Taksali) has finally decided to withdraw its candidate General JJ Singh from the Khadoor Sahib parliamentary poll fray and extend support to Bibi Paramjit Kaur Khalra. Notably, Bibi Paramjit Kaur Khalra is contesting elections on Punjab Democratic Alliance’s ticket. 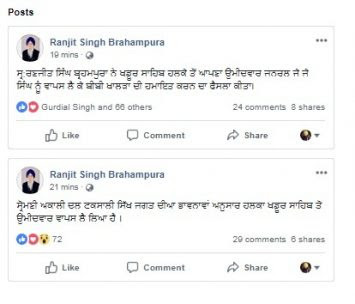 SAD (Taksali) head Ranjit Singh Brahmpura shared the development from his social media account via two text posts made at 07:30 pm and 07:32 pm (IST). In his first post, he announced the withdrawal of General JJ Singh’s candidature while in his second post he also announced to support Bibi Paramjit Kaur Khalra. On being approached by Sikh24, Ranjit Singh Brahmpura has clarified that General JJ Singh was yet to be informed about the revoking of his candidature. “I have revoked his name on the suggestion of my party colleagues today and General JJ Singh was still to be informed about this,” he added while claiming that General JJ Singh won’t mind it as he is a close friend of him. It is pertinent to note here that a majority of SAD (Taksali) leaders like Sewa Singh Sekhwan were against nominating any candidate against Bibi Paramjit Kaur Khalra from the very first day, but Ranjit Singh Brahmpura remained adamant on his stance to field General JJ Singh from Khadoor Sahib. At last, Ranjit Singh Brahmpura has to revoke his decision.